The first stroll through the garden center each spring inspires ideas and ambitions for the coming season. But thoughts of spring planting starts sometime in January for most gardeners in the North and Midwest. We start planning and browsing through gardening magazines and catalogs for new ideas, making lists of plants to look for, and gazing out our frosted windows to select a special place for a new or unusual plant. When spring finally comes, trips to every garden center in town does not produce that special new plant. Although garden centers and nurseries have continued to expand their selections in recent years, they simply cannot carry every plant available. But mail-order and dot-com growers all over the country are shipping their wide variety of plants direct to the consumers. So don't put those catalogs away! You really can get beautiful healthy plants through the mail. Most plants are shipped dormant while it is still cool, or potted and packed with moist shipping fiber. If you have never had plants shipped to you, you will be amazed when you open them at how cleverly they are packed to arrive fresh and healthy. Detailed instructions are included regarding storage until planting time, as well as preparation and planting instruction for the specific plants you have received. Perennials are generally shipped as dormant roots - yes, just the roots - so you generally get some guidance about which end is "up" and how deep to plant. Don't start feeling cheated, remember that's all that is left of the perennials out in your garden right now too. And they produce a whole plant in no time, just like that ball of roots you just opened will. 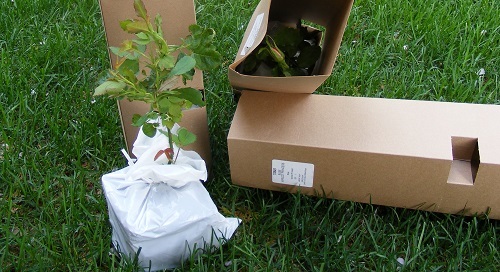 Everything from seeds to trees is available mail order, and as long as you are dealing with a reputable grower, you can feel confident that everything will be shipped appropriate to the needs of the plants. I have ordered hard to find vegetable, annual and perennial seed varieties, perennials, shrubs, evergreens, apple trees, ornamental trees, and landscape trees. They have nearly all performed as well or better than what I have purchased at local nurseries. Just as you would for any mail order business, check the guarantees and replacement policies. A reputable dealer will offer the same policies as the best local retailers. I have ordered everything from seeds to trees from catalogs and online, so the occasional problem has come up. So far every problem has been dealt with to my satisfaction. There are a few things to be careful of however. An occasional problem is misidentifying hardiness zones. Nearly every catalog I have ever seen lists one or more plant incorrectly. But zone parameters also don't account for unusually harsh winters (or in more temperate climates unusually hot or dry summers). So it is best to do a little research through other resources to confirm the zone assignment and reliability. I did order some zone 4 roses once that were the most gorgeous thing in my landscape, for one year. The following spring all three were completely dead. The grower admitted they really were a zone 5 rose, and happily gave me a certificate to replace the plants with another selection. That rose is still listed in their catalog as hardy to zone 4. And be cautious of growers that only offer species plants, and no hybrids or named cultivars. They may not be dealing in high quality grown plants. Not that you don’t want a species plants, they are often the most tough and hardy. But a species plant does not have certain superior qualities that hybrids and named cultivars do, such as extended blooming, a wider range of colors, or specific growth characteristics. Certainly there are many others whose catalogs tempt me every year, but I can’t really recommend a grower I have not tested. Some are specialists, often priced higher than other catalogs. Presumably their quality is superior, but sometimes simply because they have raised rare plants that are difficult to propagate. Look for growers located in your zone to increase the chance that their plants will survive well in your garden.